The topic at hand wasn't a secret. But women's tennis chief Larry Scott had no idea what Venus Williams planned to say when they walked into the boardroom at the All England Lawn Tennis and Croquet Club the day before the 2005 Wimbledon final. Neither did any of the other members of the Grand Slam Committee, comprised of executives from all four events, who were gathered for their customary meeting. Nine for IX: Venus VS.
Jane Brown Grimes, then a nonvoting member as the U.S. Tennis Association's first vice president, was the only other woman at the long inlaid-wood table. "I think everyone was excited to have a player at her level come in," Grimes said. "You don't often get a top player at those meetings." Still, she recalled, "We kept them waiting in the hall for quite a while." Williams didn't mind waiting for her turn to speak that day, but she and Scott were tired of waiting for the AELTC to do what they thought was the right and obvious thing: award an equal amount of prize money to the men's and women's champions and through all the rounds in the draw, as the U.S. Open and Australian Open already did. "Each year, it would inch a little closer," Scott said. "It was within 10 percent. But each year, we'd get the phone calls and we'd be disappointed. There was growing irritation." Scott didn't say much in the way of introduction. He didn't need to. Williams had just turned 25 and sat atop the pyramid of athletic celebrity. The day after the meeting, she would defeat Lindsay Davenport on Centre Court in a three-set thriller that remains one of the best championship finals in women's tennis history. "Venus had the on-court prowess, the commercial viability, and the activist spirit and thoughtful personality," said Ava DuVernay, who directed "Venus VS.," the first documentary in ESPN Films and espnW's "Nine for IX" series, airing July 2 (ESPN, 8 p.m. ET). "It was perfect." Williams sat tall and poised with her usual elegant carriage. She asked everyone to close their eyes. She began speaking, without notes. 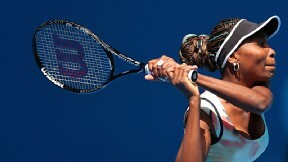 "I wasn't nervous," Williams recalled in an interview at the WTA tournament in Charleston, S.C., this past April. "For me, facing match point at Wimbledon was a lot harder than walking into a boardroom and speaking the truth. It was something that I welcomed. I like to think that was a game-changer and a head-turner and really started people to thinking." Grimes thought Williams had aced the room: "She was magnificent. You could tell she was hitting home." So did Scott, now the Pac-12 commissioner. "It was one of the most stunning, poignant, powerful moments I've ever experienced in a business meeting," he said. Yet it wasn't quite enough. When the phone calls came the following February, Scott was told the women's championship purse would be increased at Wimbledon, but still not identical to the men's. Scott caucused with the WTA leadership and top players and mapped out a more aggressive strategy. He asked Williams to be part of it. She was all-in. 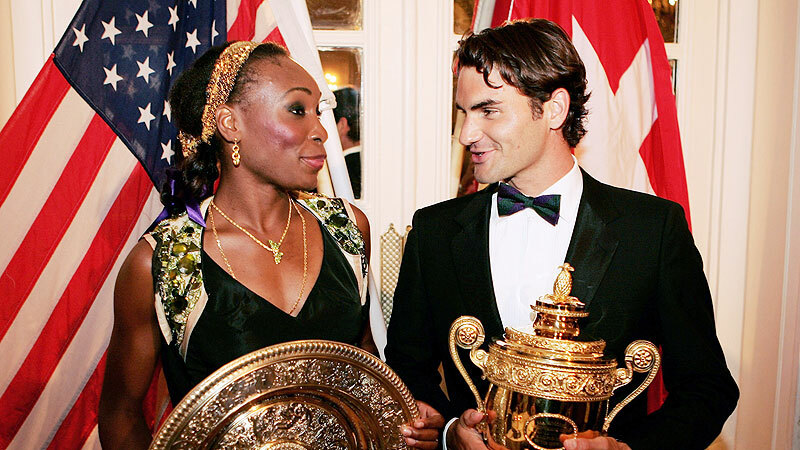 Venus Williams, left, and Roger Federer won respective Wimbledon singles titles in 2005 and 2007, but Venus didn't receive equal prize money until '07. Stumping for equal prize money wasn't a new concept for Williams. She went on the record after her first-round match at Wimbledon in 1998, just days past her 18th birthday. "I think in the Grand Slam events, it should be equal pay, and I think the ladies should do something about it instead of just accepting it for years to come," she said. When Scott took over the WTA helm in early 2003 after years as a player and executive on the men's tour, he arranged one-on-one conversations with a number of top players. He met with Venus and her sister Serena separately at an exhibition event in Florida. Venus brought up the issue of equal prize money, unsolicited. "She said she wanted to see it in her lifetime," Scott said. "It was an important principle for her. I immediately pivoted and said, 'If we're going to do this, I'm going to need your help.'" Williams was willing. She had spent a couple of years on the WTA Players' Council by then, witnessing the annual "routine stamp of rejection" for equal pay at Slams. "You know, when you start playing tennis, you don't imagine there's a whole bureaucracy behind the tournaments and all of that. You just think about winning the cups," she told espnW.com. "I like to be busy. It's not always easy because the schedule gets busy, especially the more successful you are, the more demands you have. But it's definitely worth the sacrifice. "I found myself at the forefront," Williams said of the campaign. "A lot of players were not comfortable talking about equal prize money for whatever reason, or maybe weren't able to express exactly how they felt. But I was. We started planning things around me being the lead." Billie Jean King, the seminal crusader for equality, got to know Williams during her years as U.S. Fed Cup captain. They formed a bond based partly on their backgrounds as Southern California "public court kids," as director DuVernay put it, one from Long Beach, the other from Compton. King made a point of talking to players about the history of women's tennis, financial and otherwise, but never tried to suggest that Venus take on a specific mission or pick up her torch. She thinks Williams had an innate sense of fairness that led her down that path and absorbed the rest by osmosis. "She processes a lot -- she goes away and thinks after you have a discussion with her," King said. "She asked me about prize money. In thinking about how to make a difference, that was the obvious one. It was the right time, she was the right player, [Wimbledon's grass] was her surface and it was the right moment in history." I wasn't nervous. For me, facing match point at Wimbledon was a lot harder than walking into a boardroom and speaking the truth. It was something that I welcomed. I like to think that was a game-changer and a head-turner and really started people to thinking. In early 2006, Scott and the WTA leadership began lobbying top politicians in the United Kingdom, commissioning polls (one showed that 80 percent of British citizens favored equal pay) and writing letters. But the effort remained largely under the radar, absent from media coverage, until the opening Monday of Wimbledon. In an op-ed piece that appeared in the Times of London, Williams hammered at Wimbledon's rationale, saying the club had relegated women to second-class status. She parried every argument that had been launched against equal pay, pointing out most importantly that women were given equal billing at the Slam events and thus implicitly created equal value for the tournament. "Nobody knew the piece would be so powerful," said Williams. She said she wrote it with input from the WTA and called it a "group effort, a coming together of the minds." "It was just about really trying to express what it felt like to be treated unequally," she said. "It just took on its own life." Several prominent British politicians spoke out the same month. Tessa Jowell, then-Secretary of State for Culture, Media and Sport, wrote to the AELTC, then used a youth sports program launch as an opportunity to declare, "We are long past the time where it's acceptable for there to be discrimination between the rewards for men and women ... Men and women should compete on equal terms and be rewarded on equal terms whether it be on the tennis court, the shop floor, in the office, running track or anywhere else." She was backed by Trade and Industry Secretary Patricia Hewitt. "Wimbledon seems to have got stuck several decades back in the last century, when it was just taken for granted that women were the junior partners to men, that they were rewarded less and that their work was less valuable than men's work," Hewitt told The Times of London. "We don't accept that in law for employees. We challenge it where we find it. It's a pity that Wimbledon -- an organization that holds a major position in our national life -- hasn't caught up." The issue was raised in a question-and-answer session in the British Parliament, where then-member Janet Anderson stood up in a bright red jacket to make sure she was recognized and voiced her displeasure with the fact that Wimbledon was flaunting a principle by then entrenched in the country's laws. Prime Minister Tony Blair responded by endorsing equal pay from the floor. In November 2006, UNESCO enlisted as a partner with the WTA, naming Williams a "Global Promoter of Gender Equality." Other top women players, including Jennifer Capriati, Maria Sharapova and Kim Clijsters, joined Williams in public calls for the pay gap to be closed. But the tennis world itself was far from unified. Some male players, including a then-emergent Andy Murray, continued to argue that the men's best-of-five-sets format merited a pay difference. John McEnroe, on the other hand, posited that "a longer movie isn't necessarily better." Williams had been unable to defend her Wimbledon title in 2006, upset in the third round by Serbia's Jelena Jankovic, but all the time she and others had invested in hitting balls against the wall was about to make a difference. 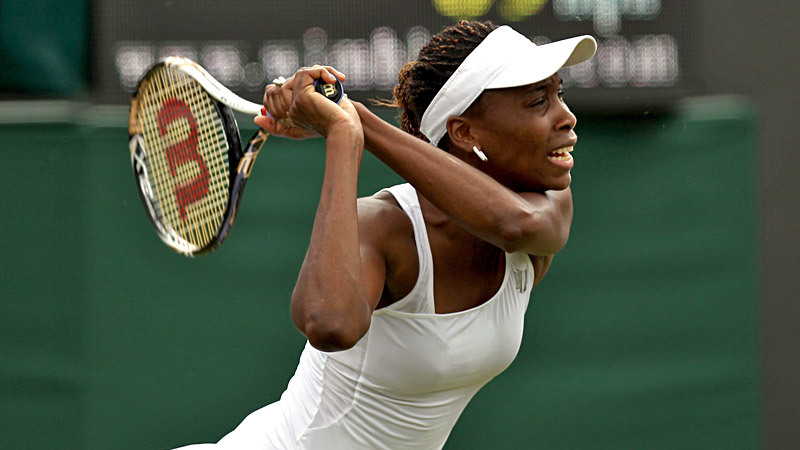 Venus Williams has won 10 career Wimbledon titles, five in singles and five in doubles. Few journeys in sports have been longer or more improbable than Williams' path from the concrete courts of her childhood to the pastoral grounds of Wimbledon. But there was also something that seemed predestined about it as she raised the silver championship trophy called the Venus Rosewater Dish in 2007 after winning the fourth of her eventual five Wimbledon titles and thanked King, who was watching from the stands. In Grimes' memory, one of the most impressive things about Williams' soliloquy to the Grand Slam Committee in 2005 was the way she framed it as "a leadership opportunity for the sport," Grimes said. "She made a big point about the social impact rather than haranguing them." Williams withdrew from Wimbledon this year for the first time since 1997, citing a lower back injury, and her overall stamina is increasingly sapped by the autoimmune disease Sjogren's syndrome. But her presence on Centre Court is permanent. She got results. She helped open people's eyes. She said she was confident the club would correct course on equal pay eventually, and she understood the face-saving delays. "It's hard because when you've been saying no all these years, it's hard to kind of step back and say, 'Hey, we weren't right,'" she said. "I definitely feel like it's something I couldn't have done alone. I most certainly don't take credit. "Like I said, I just feel like, 'There I was,'" Williams said, her voice taking on a whimsical lilt. "And that's how it happened. It's not anything I was planning on. So many people came together for that to happen. More than anything, I feel like it was a great thing to be a part of that team that was able to succeed in doing the right thing."